Election years call for new and intrepid ideas, policies powered to rise above the rude hurly burly of we vs. they, consecrating their noble intentions to nothing less than the greater national good and putting the sectarians to rout. So here’s my idea: Let us tax all Americans in proportion to their Twitter following. Fair, indubitably transparent, and toughened against all loopholes, the plan would finally redistribute the wealth of Bill Gates (8,505,521 followers) until we’d get to call it the Melinda Gates Foundation, expropriate the assets of Lady Gaga (follower count: an end-of-civilization-as-we-know-it 30,211,539), and gladden the meek and diffident Twitterers with their double-digited coteries, who’d be emboldened to slip the plain brown wrappers off their bankbooks with pride. And once implemented we’d never again have to pester Mitt Romney about his returns; we’d know. In short, economic justice at last. But there’s more you can do with Twitter than just hammer another plank into some dreamer’s platform. There’s information sounding faintly through the white noise – at least I think there is, somewhere, somehow; and indeed, a thick catalogue of apps out there perform, or purport to perform, all manner of analysis on the billions of tweets riddling the cyber cosmos. Now while I can hardly claim to have surveyed all of these (and you’d probably think ill of me had), but after some concerted fooling around with a number of candidates I’ve cast my vote – a provisional one, mind you – for www.twdocs.com, a free and acceptably easy, and remarkably speedy tool for downloading tweets by any key term into Excel. But the analysis writ large, requires about two-and-a-half-steps – that is, getting the data into your worksheet, and then deciding what you can learn from them. The half-step trudges between the other two – understanding what sort of data you’re about to get, and by extension, perhaps, what you’re not going to get from twdocs and Twitter in general. That is to say: the analysis of tweet traffic – the figuring of tweet (and retweet) frequencies by key term broken out by month, day, hour, minute, or perhaps even seconds, user stats, and perhaps even a bit of content analysis – is constrained in part by the number of tweets you can rightly hope to access. It appears Twitter sizes its tweet-download maximum at about the most recent 1500 (the number I’ve seen at numerous app sites), and twdocs appears to reach back to only the last week’s worth of tweets, an interval which may slim some outputs well beneath 1500, simply because the searched-for term hasn’t been invoked that often in the past seven-or-so days. Also, the results aren’t quite real-time, though they’re real close. In addition, while every tweet entry that boxes itself in your cells is time-stamped the entries need to be calibrated to the understanding that people are tweeting worldwide, so one tweeter’s 8:00am is another’s 1:00pm. (The data I download seem to lag precisely an hour behind my Greenwich time zone, which either bespeaks an hour delay or the fact that twdoc’s server is somewhere over the Atlantic. In fact and for what it’s worth, twdoc is Latvia-based; in any case you should check the data against your zone.) So, if among other things you’re interested in the rates of tweeting activity for a given topic, these data should stand you in good stead. 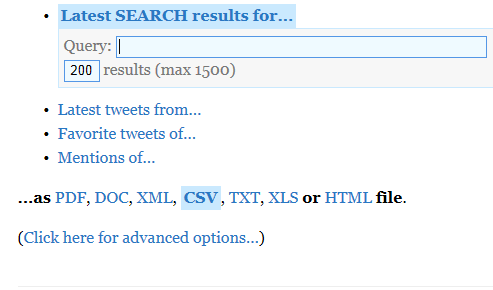 Keep in mind as well that you can download data for the same search item the next week, too, at which point you can stack this week’s output atop the earlier ones, and thus still accumulate a large, relatively current and continuous batch of tweets. As we hope to demonstrate, you probably want to search for terms that capture your intent as generically as possible. You can search for @obama, #obama, and Obama, but the last-named should excavate the largest set of entries, and it does. A short while prior to typing this sentence, I entered Obama (in search of a max of 1200 results) and came away with 1200 entries spanning 2 minutes and 56 seconds. Entering #obama just a bit later yielded its 1200 in 1:58:05, or nearly two hours. The twdocs engine seems impressively accurate and comprehensive. 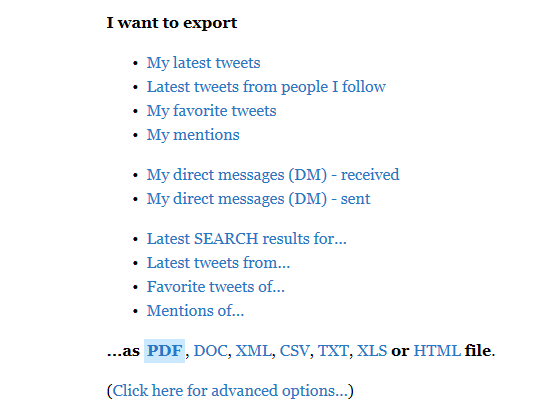 Now if you’re interested in rates – i.e., tweets per hour, etc. 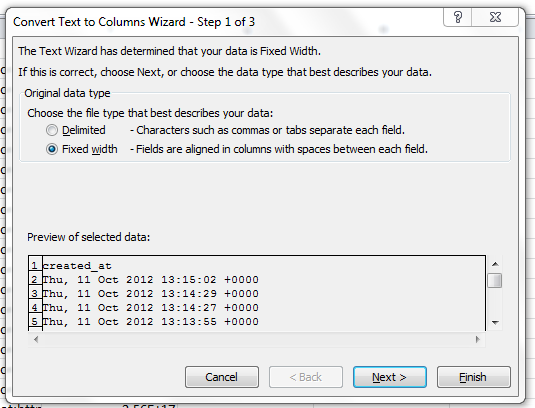 – you most assuredly will be interested in the created_at field in column C (needless to say, you can rename the columns). 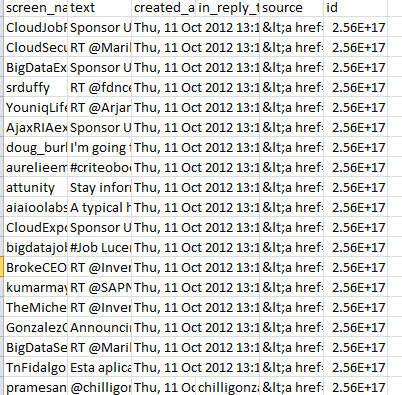 The data here amalgamate weekday, day of month, and time of tweet data, and as such need to be broken out. And the instrument towards this end is none other than the classic Text to Columns options, which dices information in a cell into sections, the widths of which are your call. 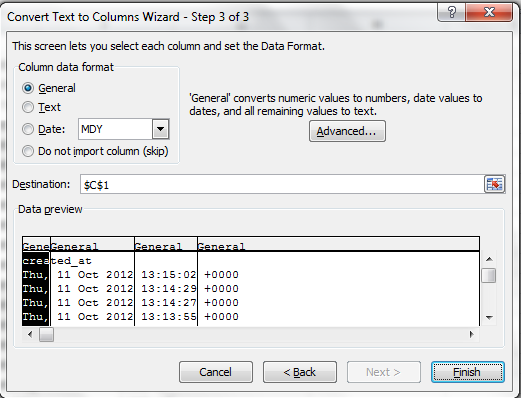 When all is said and done we want to have assigned weekday, day-month, hour, and minute to discrete, independent columns, the better to pivot table them and the like. 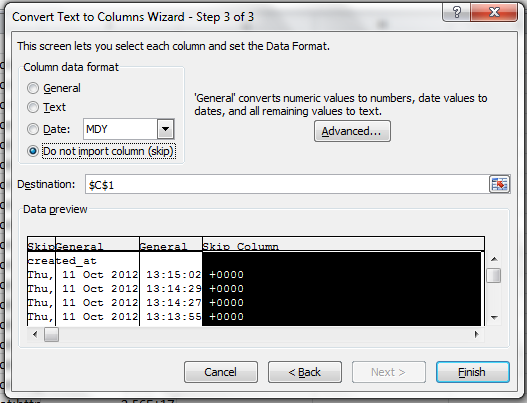 And copy down the column (and title the column, too). I get 13 in G2, as I’m operating with European time settings. 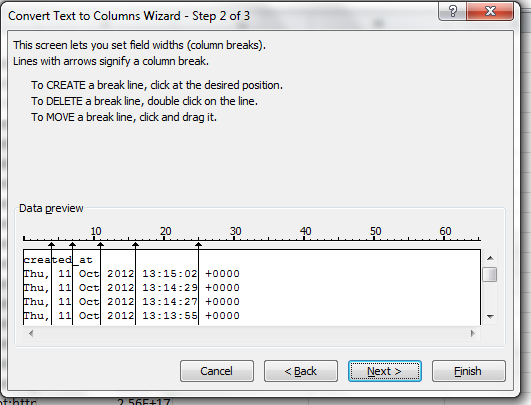 And copy down the column (it needs a header, too). And if you haven’t been saving the workbook throughout, save it now! Now the sheet is primed for analysis. Let’s see what we can do with it. In the meantime, just remember – if you stop following Lady Gaga, you’re an accessory to tax evasion.